Dealing with liver disease or any chronic illness can be challenging enough and can bring an out of control feeling. Your diet is something you can control. It gives you a sense of being behind the wheel with your health. The old adage ‘you are what you eat’ is true. What we eat affects our entire body, especially our liver. The liver is the powerhouse of the body. It is the second largest organ and helps with many vital functions. When our liver is unhealthy, it affects our entire body, even your immune system, which helps you fight disease. Think of your liver in terms of a highly efficient engine and filter. What you eat, drink and expose to your body is chemically broken down by your liver and affects your immune system and many other functions of your body. It’s important to eat and drink the right fuel in order to operate effectively. With having Hep C, I learned 12 healthy diet tips for Hepatitis C or any liver disease that help the liver do its jobs and help repair some liver damage. The American Liver Foundation states that eating an unhealthy diet can even lead to liver disease. For example, a person who eats a lot of fatty foods is at higher risk of being overweight and having (NAFLD) non-alcoholic fatty liver disease. An unhealthy diet and exposure to dangerous chemicals can do damage to your liver and cause it not to function properly. Like ‘sludge’ in your gas tank an unhealthy diet can slow down or worse, lead to compromised liver function. 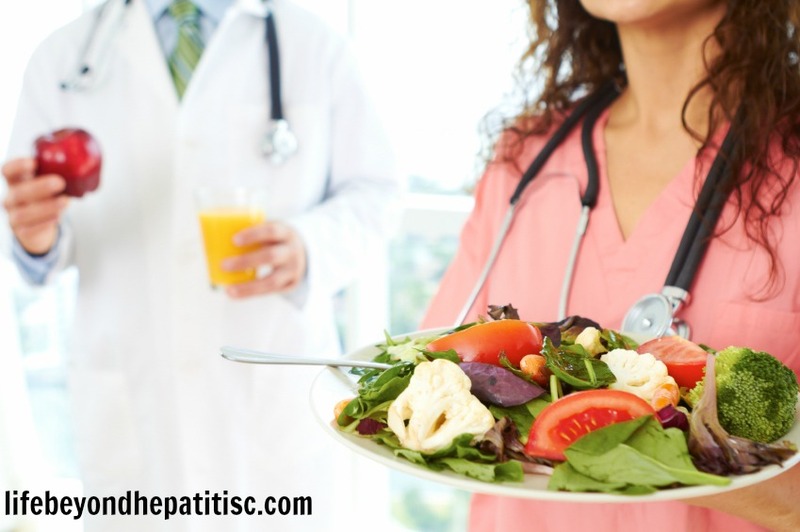 When I was first diagnosed with Hep C over twenty years ago, along with seeing my liver specialist, I saw a registered dietitian for nutritional counseling. I wanted to know from having Hepatitis C what kind of diet was best. Eating foods from all food groups in healthy portions such as whole grains, lean proteins, low fat dairy, fruits, vegetables and healthy fats. Eating foods with high fiber such as fresh fruits, vegetables, lentils, beans and whole grains are liver healthy foods. Fiber it up, it’s nature’s broom to help eliminate toxins from the body. Eat a well balanced diet, but eat lean proteins from poultry, fish, and plant based proteins. Limit red meat due to this is harder and takes longer for your system to break it down, plus it can contribute to bloating. Avoid uncooked shellfish such as oysters and clams or other uncooked meats. Limit foods and drinks that are high in sugar and salt. Limit eating high fatty foods. Limit eating fried or processed foods. Stay within a healthy weight range because the liver can function better than if we’re over or under weight. Eating smaller meals throughout the day is also better than large meals. Your liver has to work harder to break down high fat and larger meals. This will also help stabilize blood sugar, cravings, and the bloated, sleepy feeling that can come from eating larger meals. It is best to limit foods that have a lot of sugar and high sodium (salt). High sodium foods and eating too much protein will make you retain fluid and can lead to excess toxins in your blood stream. Be careful not to limit your protein too much because it can result in a lack of certain amino acids that is essential for your body to function properly. Drink plenty of pure water, filtered if possible. Drink at least 64 ounces a day. Avoid Alcohol. Alcohol is like throwing gas on a fire with liver disease and increases damage.